The larger Venus of Parabita is 90 mm high and 20 mm wide, and is made ​​from a splinter of bone from an aurochs or horse. There are no features on the face, while the chin and neck is crossed by two parallel curved incisions, creating the impression of a collar or hood. From here the two sloping shoulders continue into arms, which become thinner, then thicker, and finally come together under a prominent abdomen, perhaps indicating pregnancy. The breasts and the pubis are clearly shown, as well as the buttocks. The thighs are only indicated by a shallow groove, and do not continue past the knees. 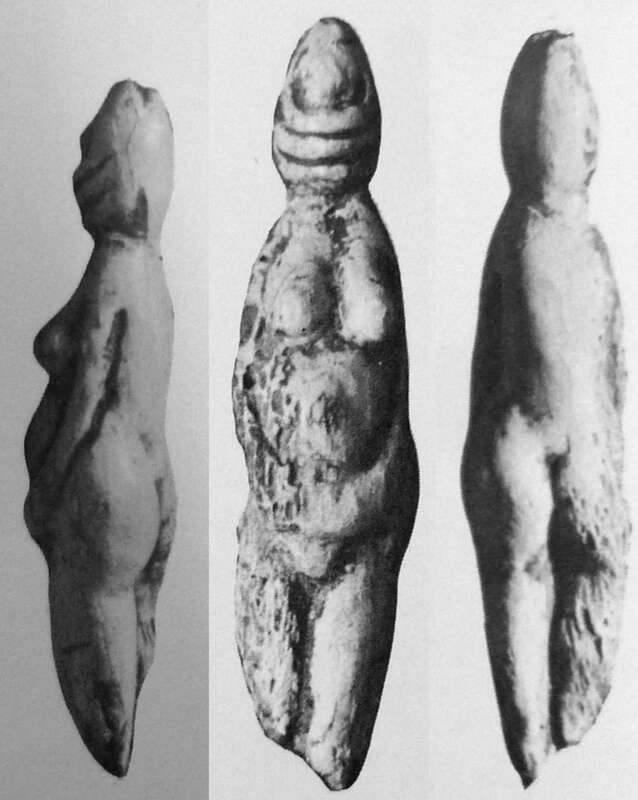 A second venus is smaller, 61 mm high and 15 mm wide, and has different stylistic features. The head is rounded, with no indication of features, the neck is indicated by a groove. The shoulders are hardly indicated, but from them come two arms, thin at the top, widening into much larger hands clasped under the abdomen. The breasts are pendulous and oval, the abdomen is flat, the buttocks barely indicated. 89 mm high and 21 mm wide, the venus is made ​​from a splinter of bone from an aurochs or horse. There are no features on the face, while the chin and neck is crossed by two parallel curved incisions, creating the impression of a collar or hood. From here the two sloping shoulders continue into arms, which become thinner, then thicker, and finally come together under a prominent abdomen, perhaps indicating pregnancy. The breasts and the pubis are clearly shown, as well as the buttocks. The thighs are only indicated by a shallow groove, and do not continue past the knees. Source: Facsimile in the Venusium, a museum at Willendorf in Austria. Another version of the first Parabita Venus. 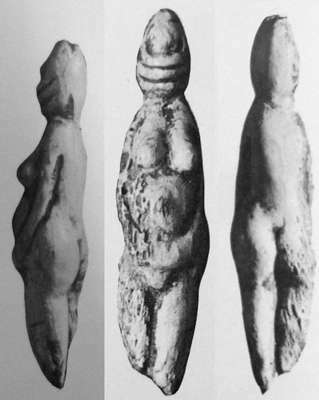 A second venus is smaller, 61 mm high and 15 mm wide, and has different stylistic features. The head is rounded, with no indication of features, the neck is indicated by a groove. The shoulders are hardly indicated, but from them come two arms, thin at the top, widening into much larger hands clasped under the abdomen. The breasts are pendulous and oval, the abdomen is flat, the buttocks barely indicated. The buttocks terminate in a kind of hook, indicating that it may have been a pendant. Another version of the second Parabita Venus. Located about 2 Km north-west of Parabita in the Tufara locality, topped by an olive grove is the 'Grotta delle Veneri', or Grotto of Venus. 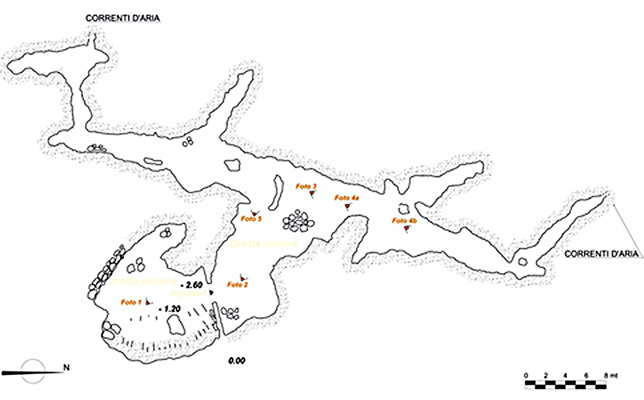 The cave, previously known as the 'Grotta Nicola Fazzu', was changed to Grotta delle Veneri after the discovery of two Palaeolithic female figurines made ​​of bone. The cavity, which extends for a length of over a hundred metres in the Cretaceous limestones of the Melissano formation, can be divided into two sectors: the cave-shelter outside, the result of the progressive retreat of the roof over time, which has created a roughly circular area, in which are evident the enormous masses of the collapse that sealed the rest of the prehistoric deposits, and the inside the cave, in turn divided into a central passage and two side passages to the north and west. The first systematic archaeological investigation following the discovery of the venus made ​​it possible to define the stratigraphic sequences of the cavity and the chronologies of the prehistoric use of the cave. A burial of a man and a woman, partially destroyed by neolithic digging which destroyed the upper limbs and skulls of the dead, was discovered by Professor Giuseppe Piscopo in 1965. However the burial retained a pebble and a piece of flint coloured with ochre, as well as 29 perforated deer canines. More than 4000 artefacts of art on stone were recovered, as well as bone fragments. The stones were decorated with geometric patterns. The designs tend to cover all of at least one face of the stone, extending to the edges, as well as onto the opposite face, and traces of ochre are sometimes preserved in the grooves of the designs. 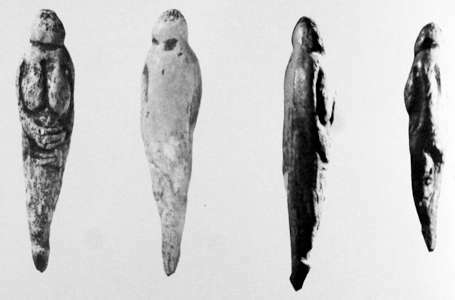 The breakage of most of these artefacts could be intentional, related to ritual events. More than 18 000 ceramic pieces from the Neolithic and early Bronze Age makes this one of the most important prehistoric sites of Puglia, the 'heel of the boot' of Italy.